This afternoon (November 5, 2016) on the banks of the North Platte River, Backcountry Hunters & Anglers’ president and CEO exhorted a crowd of sportsmen and outdoor enthusiasts to stand united against efforts to divest Americans of the nation’s public lands and waters. 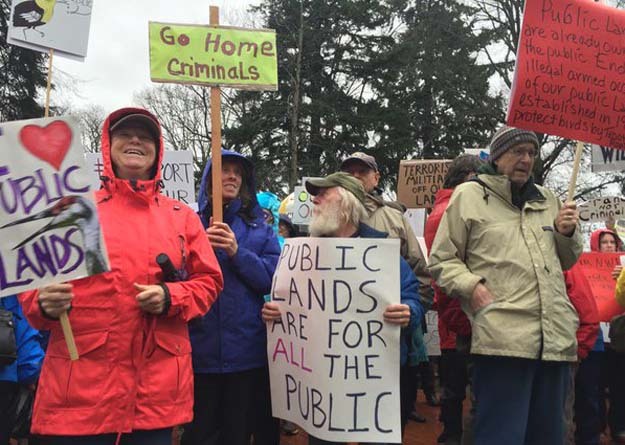 The “Deceivers” behind stealing your public lands drape themselves in the American Flag and shout “States Rights” and our “Government is Bad.” Beware! Image credit ONDA @TheOregonDesert. Backcountry Hunters & Anglers is the sportsmen’s voice for our wild public lands, waters, and wildlife. Visit BHA website . . . NOTE: Featured Image Voyager Pursuits.